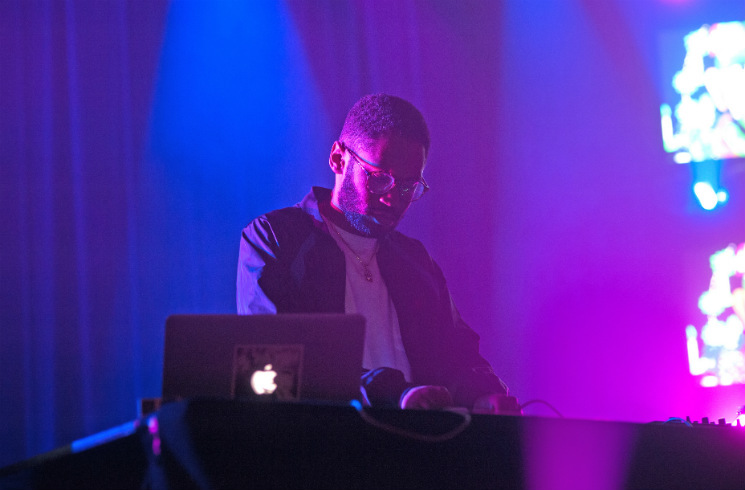 Flames Central was bursting at the seams by the time Kaytranada (also know as Louis Celestin) took the stage as part of Sled Island yesterday evening (June 24). The highly sought-after Montreal producer launched straight into "Track Uno" from his debut full-length, 99.9%, exciting the crowd from the first note. Funky visuals lit up the room's many screens as Celestin let the music speak for him, gesturing as certain beats dropped and the audience went wild. "Together" and "Got It Good" elicited cheers from the crowd, their impeccable grooves undeniably danceable. Kaytranada varied his set, playing a range of tracks from Anderson .Paak's "Lite Weight" to a remix of "Kiss It Better" by Rihanna. Embellishing and breaking up the beats on tracks, Celestin showed off his skills as a DJ and an experimenter. He didn't have to say a word to concertgoers — the music drew them all the way into his pulsating world.